All-in-one to make your Internet surfing easy. Save time on web pages viewing.! iNetAdviser makes it easy to avoid visiting the same web pages with its handy highlighting feature. Just hover your mouse over a link to see your personal comments, page screenshots, last view date and more! iNetAdviser tells what pages of a given site you already visited and view all the related comments in a single window. 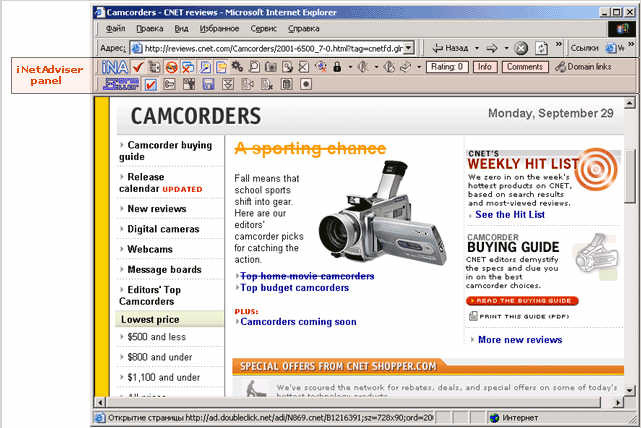 It combines the functionality of a multibrowser, pop-up and ad killer, and an advanced bookmarker. Thanks to its convenient link highlighting feature (strikethrough, color highlighting, pop-up hints) iNetAdviser makes it very easy to avoid visiting the same web pages twice. You can add your personal comments to the current web page, bookmark it, assign it a specific rating, create a Rubricator linkage and much more ¨C all from the active browser window. iNetAdviser makes browsing within a domain more convenient than you can imagine. iNetAdviser offers you advanced page comment management capabilities by making it easy to view all the domain links comments in a single window. iNetAdviser essentially simplifies navigating between the loaded pages (tabs), which are connected among themselves by cross-references. iNetAdviser allows you to make snapshots of the web pages you visit. iNetAdviser is a handy alternative to a conventional browser. iNetAdviser provides a variety of ways to open multiple sites with a single mouse-click and iNetAdviser allows you to customize the window tabs layout, lock them to avoid accidentally closing a tab, and more. 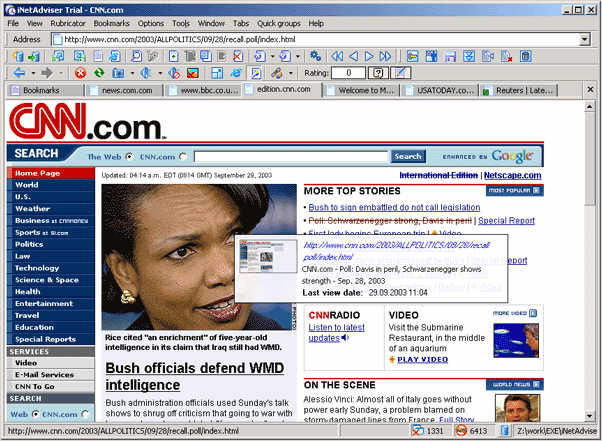 A special Fast View Navigator pane allows you to easily navigate through the currently opened pages. Using the Quick Groups Manager, you can easily create lists of frequently visited bookmarks and group them by topic. iNetAdviser allows you to open any link from the selected web page area, or every link within the current web page with a single mouse-click, iNetAdviser provides the capability of loading and saving your current working browser session. iNetAdviser allows you to block unwanted pop-up windows.iNetAdviser makes it possible to avoid loading nagging banner advertisements. iNetAdviser makes it easy to avoid loading graphics from outside of the current web site, iNetAdviser allows you to clear all traces of your web activity that Windows automatically stores on the hard drive ¨C just with a single mouse-click. With iNetAdviser you can add web pages to different bookmark archive rubrics, while conveniently searching and loading them. By using the Rubricator you can get a list of rubric-related web pages. iNetAdviser allows you to generate customized reports, The neat system of bookmark search allows you to easily access your archive data. iNetAdviser supports bookmark lists and allows you to perform several list operations. For example, you can load combine and save lists, and check them for unnecessary duplicates. iNetAdviser can import and export either the complete database or any of its parts. using the online translation feature, you can easily translate a web page into any languages, You can use the iNetAdviser voice engine to listen to the content of a web page of your choice. iNetAdviser allows you to create aliases for you favorite Internet addresses and allows you to configure the look and feel of the program. iNetAdviser provides multilingual support: currently English, German, Spanish, Dutch and Russian are supported, with support for more languages planned.